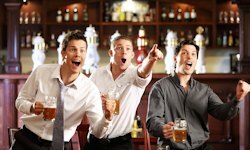 Our Sligo Stag Party Package includes accommodation, main course and a pint, reserved areas in top Sligo Bars and VIP admission to a top Sligo nightclub including complimentary drinks. The Sligo Stag Party Package includes accommodation right in the centre of Sligo town including breakfast each morning. We will give you a number of options for accommodation depending on availability. (Sligo accommodation can be booked online – book accommodation only). SATURDAY NIGHT your group will enjoy a scrumptious main course & pint in a top restaurant. Your group will receive top quality food and service, vegetarian and ceoliac catered for. SATURDAY NIGHT your group will be on the guest list to another Top Sligo Bar where an area will be reserved for your group. This is a very popular bar with four bars over three levels and two outdoor heated garden areas. Live DJ every Saturday night. SATURDAY NIGHT your group will be on the guest list to a top Sligo Nightclub – VIP Entry, Reserved Area & Complimentary Shots on arrival. This nightclub is extremely stag friendly, open until late so you’re sure to have a night to remember.